Eagle mania has hit Pere Marquette once again as visitors descend from miles around to catch a glimpse of the majestic bald eagle. Here are some tips and tricks for the bald eagle watching beginners out there! First Things First…Eyes On The Road! 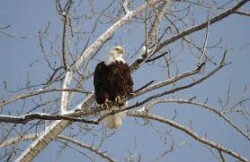 Most eagle watching tours start off with cruising the Great River Road with an eye out for eagles. While this is an excellent way to start your adventure, it’s potentially dangerous if you don’t have your other eye on the road. If you see people pulled over… go ahead and pull over too and then look for the eagle. It is much better to see the eagle a few seconds later, than to be seriously injured in a car accident! Adult bald eagles are chocolate brown with a white head and tail. They spend most of their time perching and can be spotted sitting on a tree limb or posing on a block of ice on the river. Scan the trees with an eye out for their white heads and when searching the river look for a solid brown mass. If you catch a glimpse of a large bird soaring high above make sure to look for the distinctive white head. This is a good way to avoid excitedly pointing out an eagle that turns out to be a turkey vulture…somewhat less majestic. The bald eagles that visit us here in the river bend area (with the exception of a few year-rounders) are just visiting for the winter. Admit it, if you were heading to Florida for the winter you would expect a certain degree of hospitality. Therefore, try not to disturb the eagles. Leave feathers on the ground and nests undisturbed so our beautiful guests will return again next year.